John Schumacher, endorsing agent for the Fellowship of Grace Brethren Churches, received a special recognition this month in Washington, D.C.
On January 15, John was presented the Centurion of the Year award at the National Association of Evangelicals Chaplain’s Commission (NAECC) had their annual meeting. The award is an authentic miniature of the helmet that Centurion military leaders in the Roman Empire wore as part of their uniform. In previous years the award was often given to a retired General Officer who had lived a life of service, not only to his country but also to his Lord. The individual had also been chosen for his distinguished career and for his support of the work of chaplains. In more recent years several senior chaplains have also been selected for the award. John’s wife, Martha, was also recognized for her outstanding service as a model military wife. Early on John brought the FGBC chaplaincy on board with the NAECC as an affiliate member to provide a broader base of support for our chaplains. John served three years as the Chairman of the Executive Committee for the NAECC. From the Eagle Commission newsletter. 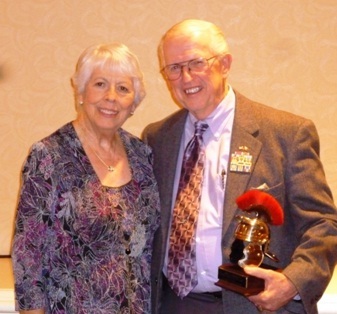 John is a most-deserving retired soldier and dynamic Christian for this award! What a privilege for our Fellowship to have Col. Schumacker as endorsing agent and member of the FGBC. Congratulations, John. You will always be honored and never forgotten! Col. Schumacher, congratuations to you and Martha and thank for your continued service to our chaplains on behalf of the Lord and the FGBC! Congratulations on this well deserve honor for your continued service for the Lord and our nation's military. John and Martha have and continue to be an exceptional model of our military chaplaincy and I personally want to thank you both. May the Lord's blessing continue to encourage you as you minister together to our young men and women who serve our country!